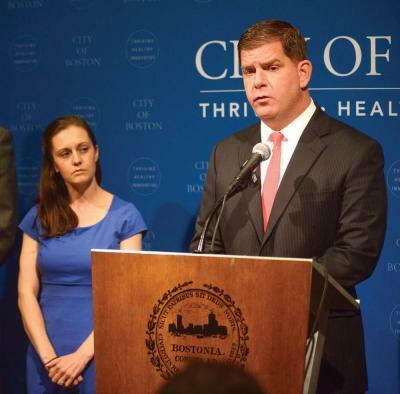 Mayor Martin Walsh convened a press conference on Monday to announce he would not sign a taxpayer guarantee for the proposed Boston 2024 Games without seeing the text of the agreement first. At left, he is joined by Sara Myerson, executive director of the Office of Olympic Planning. Photo courtesy Mayor Walsh’s press office. The hope for Boston’s Olympic flame – or the aspiration to light it in the summer of 2024 – was extinguished on Monday afternoon when the US Olympic Committee and Boston 2024 announced that they were jointly ending Boston’s bid to host the Games. Dorchester stood to bear the impact of some of the most significant activity associated with the the Games. The organizers’ final plan saw a build-out of Columbia Point for a 6,000-bed Athletes Village, a re-working of the Kosciuszko Circle rotary, an upgraded JFK/UMass Station bus platform, and a greening of Columbia Road. Michael Vaughan, who has advised the New Boston Food Market throughout the Olympic planning process, said Boston 2024 has focused attention on Widett Circle, the current home for the 800-employee food production facility. Last summer, New Boston Food Market sought to make noise about a proposed trash transfer and recycling facility known as Celtic Recycling that was trying to move into a parcel that abutted Widett Circle – something that Vaughan still maintains would be bad for the New Boston businesses. Now, that issue is back on the table. “Isn’t it funny that a year earlier we were talking about a transfer station and a year later we were talking about a 60,000-seat stadium? It took 12 months to evolve that far.” Vaughan said, adding that he hopes the concept of Celtic Recycling is “a positive casualty of the Olympics.” added. A representative for Celtic Recycling did not return a request for comment. State Rep. Russell Holmes was a vocal supporter of the Games last month as organizers behind Boston’s bid announced that Franklin Field’s Harambee Park and Sportsmen’s Tennis Association would be tennis venues for the Olympic and Paralympic Games. The Dorchester green space and accompanying facility are in his district. “I think the mayor and the governor did a great service to us by sticking to their guns,” said state Rep. Dan Hunt, whose Dorchester district includes Columbia Point, JFK/UMass Station, and Kosciuszko Circle. On Friday, the Associated Press reported that the USOC had given Baker an ultimatum to support the bid – something the governor denied in a press conference that day. Baker participated in the Monday morning call with the USOC, and had told reporters on Friday that he would hold off supporting or opposing the bid until an independent study of the bid could be completed by the Brattle Group. That report, commissioned by Baker, the state Senate president, and the speaker of the House, is due sometime in August. In the end, Walsh’s decision to push back against the US Olympic Committee resonated. Despite Monday’s outcome, the mayor and other elected officials hailed the benefits of the extensive planning process for the hoped-for Games. Gov. Baker agreed that Boston 2024’s planning process would bring benefits specifically to economic development and transportation. “Some of the analysis in terms of the economic development proposals and transportation initiatives like the K-Circle piece, I think were pretty thoughtful and were things that we can learn from going forward,” he said at a press conference on Monday.